At all three, Salinas Puebloans had to deal with the ecclesiastical demands on their time and souls, and civil demands for annual payments of goods, including corn, salt and cloth. Both “kings” expected labor. 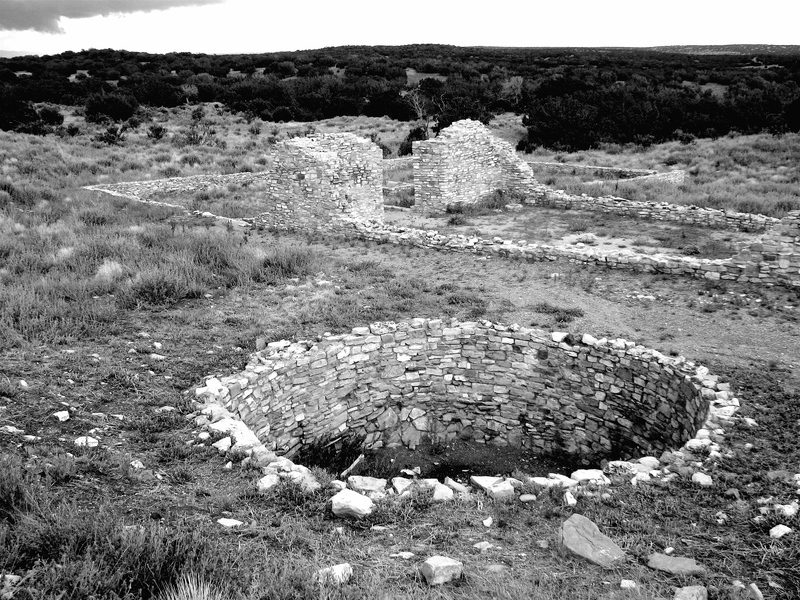 And while at first allowing the kiva rituals to continue, by the mid-1600s the priests had outlawed them. But, at least at Quarai, civil authorities, in an obvious effort to undermine the church, encouraged the kachina dances. At Abó and Las Humanas as well, the rituals no doubt continued in secret. Caught in the middle, it’s clear no matter what they may have thought, the Native Americans were left precious little time to tend their own fields, or to the other needs of day-to-day life, much less to these rituals they had always relied on to preserve the delicate balance of their lives with their world. So when the rains refused to come, when all the cottonwoods had been cut down for timber, when the Apache raids became ever more frequent, when disease came, when nobody sent supplies, when no god would answer their pleas, the People and their priests began to leave. In 1668, 450 Indians starved at Las Humanas; by 1670 the Apaches had, in effect, finished off the pueblo. Abó was abandoned about 1673 after raiding Indians burned the convento. The remaining 200 families left Quarai in 1677, taking with them the remains of their favorite priest Fray Gerónimo de la Llana. They left going northwest. There, on the Rio Grande, they were absorbed and mostly forgotten. 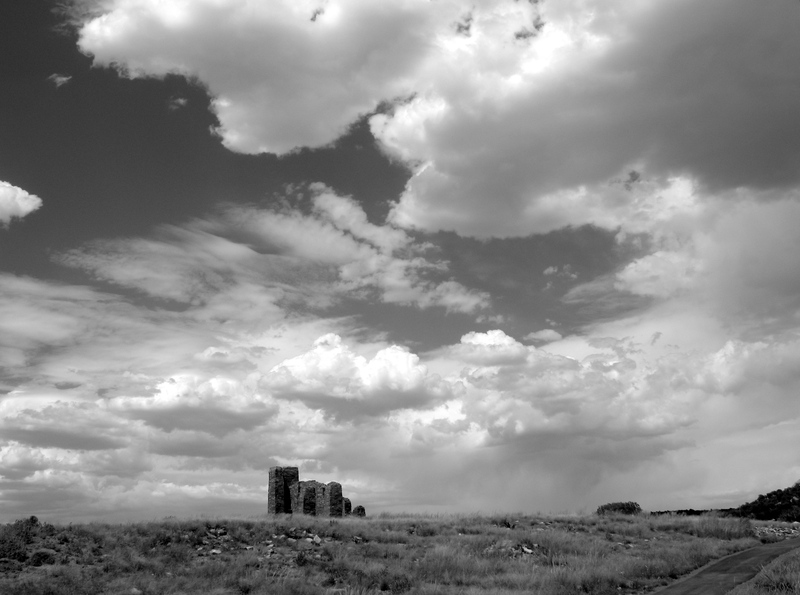 As the last stragglers disappeared around the hill, the days of the Salinas pueblos as living communities came to an end. Eventually, in the slow process of decay, all that would remain is what we marvel at today—multi-story windblown walls and mounds of scrub-covered rubble. 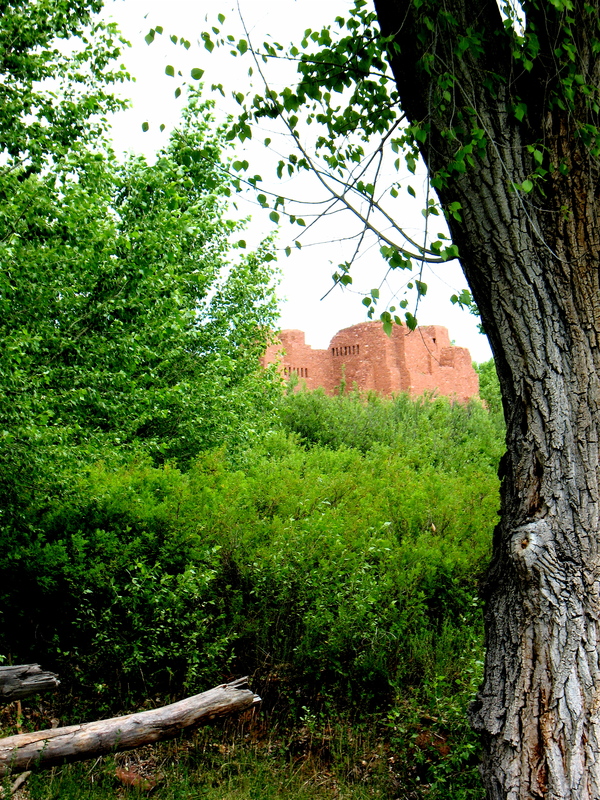 Of the three pueblo missions in the Salinas Monument, Quarai’s sheltered location up a narrow canyon complete with spring and cottonwoods is undoubtedly the most felicitous. With their neighbors at Tajique and Chilili just north, Quarains worked joint fields of corn. Across the valley, less than fifteen miles east, were numerous dry lakes, a vital source of salt as well as a prized trading commodity. A thriving town of 400 to 600 when Oñate first visited in 1598, Quarai’s leaders agreed to sign an Oath of Allegiance to the King of Spain. But historical records confirm there was resistance. 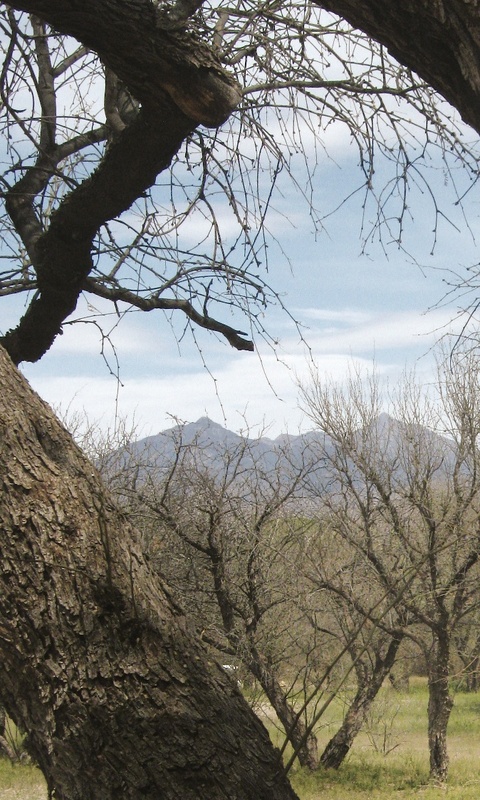 In 1601 a six day battle occurred after two of Oñate’s soldiers were killed near Abó. 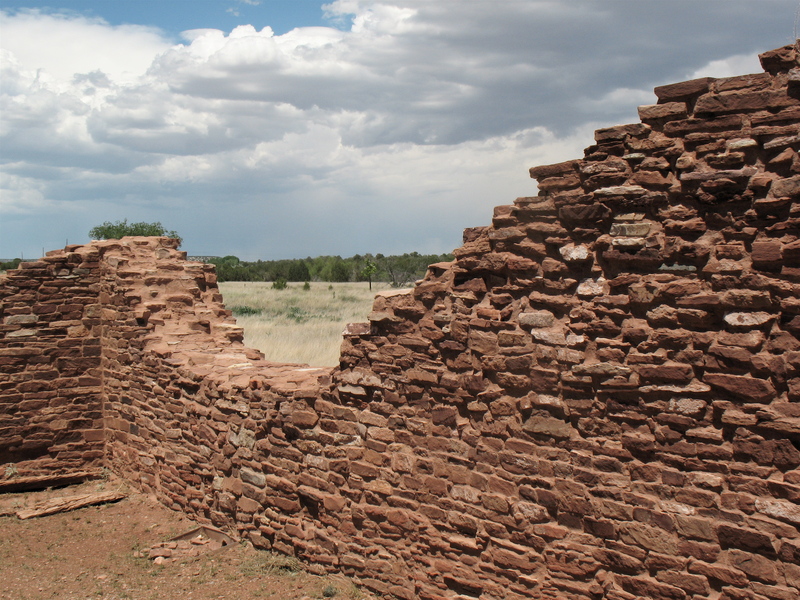 When the Quarains retreated to their fortress-like pueblo, the soldiers set it on fire. Reportedly, at least 900 Indians (obviously a gross overstatement by the victors) were killed. On foot, armed only with bows and arrows, the locals proved no match for the horse-riding harquebuse-toting Spaniards. La Purisima Concepcion, faces almost due south and the transept’s windows, placed in an offset roof line, allowed the nave to be filled with sunlight. Even at Christmastide, the altar would have been illuminated by the glorious New Mexico sun. Covered with elaborate and colorful vestments, statues and paintings, its main altar, set against the whitewashed stuccoed walls, would have made quite a powerful statement. Today, standing inside the church, enclosed by high red sandstone walls, its original flagstone floor beneath my feet, listening to the remarkable acoustics (a conversational voice can be heard throughout the 100 foot nave), it is easy to imagine faint phantom echoes of the organ brought from Mexico City, accompanying chanting from the choir loft above, and a ghostly priest moving deliberately from one side of the altar to the other, in preparation for the Mass. Gran Quivera/Las Humanas (the original Spanish name) is the farthest south of the three units that make up Salinas Monument. President Taft designated Gran Quivera a National Monument in 1909. 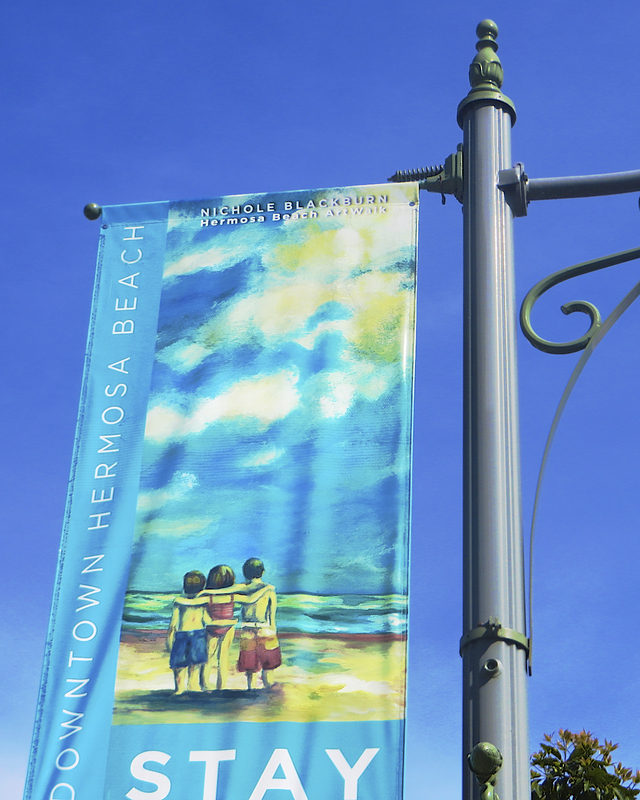 The people of Las Humanas were different from their Quarai and Abó neighbors. They painted or tattooed the upper half of their faces, like the plains tribes with whom they had extended contact. They stood taller and spoke a different dialect. 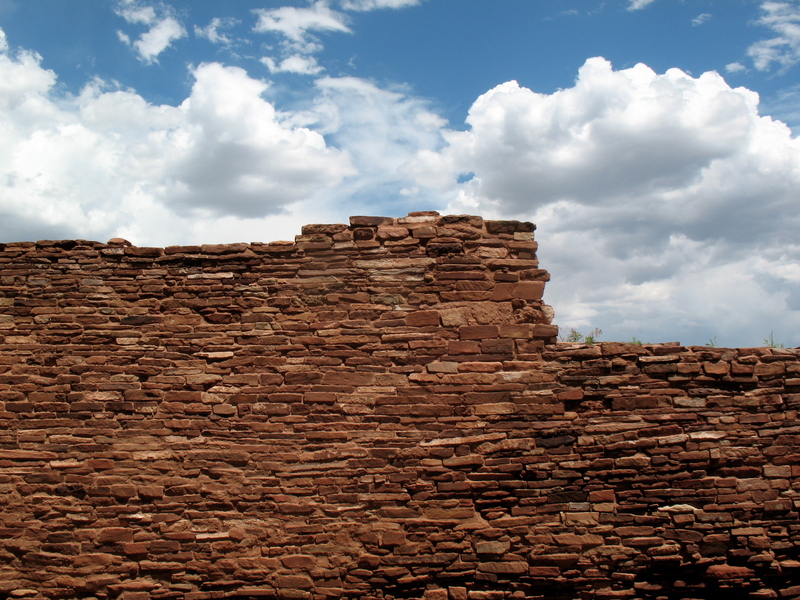 And their pueblo was built not of red/gold sandstone but with local gray/brown limestone. Las Humanas had no spring or stream. So residents made enormous bubbles of clay canteens, which they strapped to their heads or backs, and hauled gallons of water to their pueblo from nearby shallow-dug wells. The lack of water controlled population and severely limited their ability to irrigate fields. It may also have been the main reason no grand church building was ever completed there. So at Las Humanas the pueblo itself takes center stage. Atop Chupadera Mesa are at least 15 multilevel cobble-walled apartment complexes clustered around a main plaza and subplazas. Each block was constructed by accretion: Most rooms were accessed only through others or through the roof. The bones of the largest building, a semicircular “D” of wedge-shaped rooms, underlies later rectangular rooms constructed in stepped back fashion, rising four stories. Stuccoed and towering in the sky it must have presented quite a picture to the roaming plains tribes. 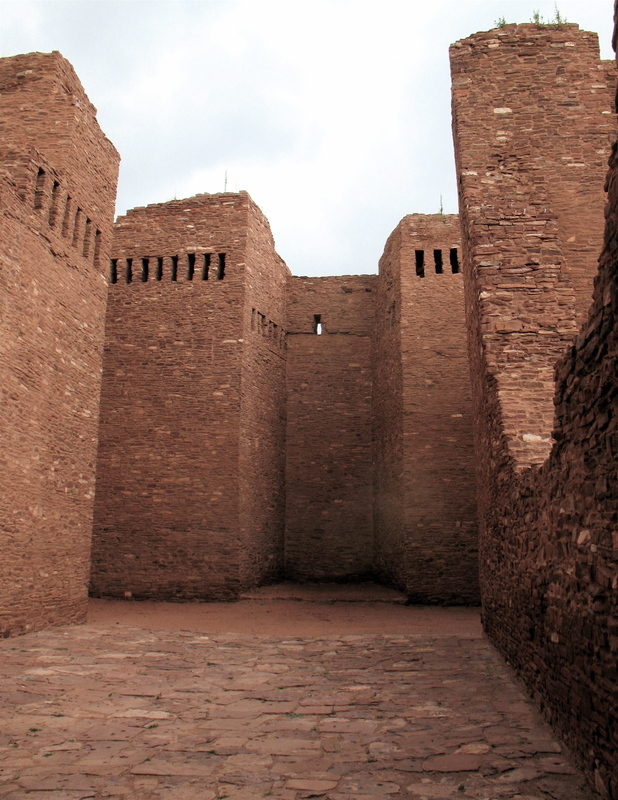 There were at least seven kivas scattered around the pueblo—a large one in the main plaza for group events, and other smaller ones for individual clan use. Fetishes suggest a rich and vibrant religion, one grounded in daily needs and continuous intercession. Then the Spaniards came. 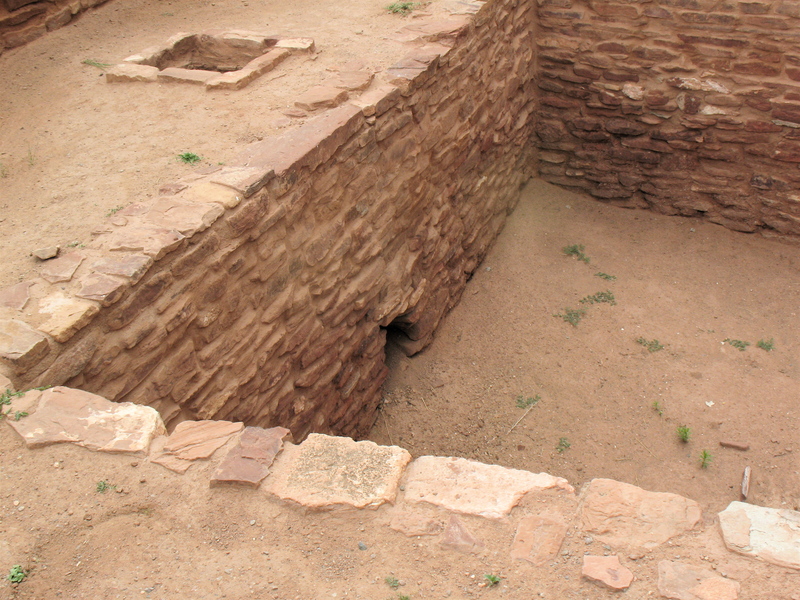 At first the kiva culture continued. But as the occupation wore on, Indian-based religious practices were forbidden. 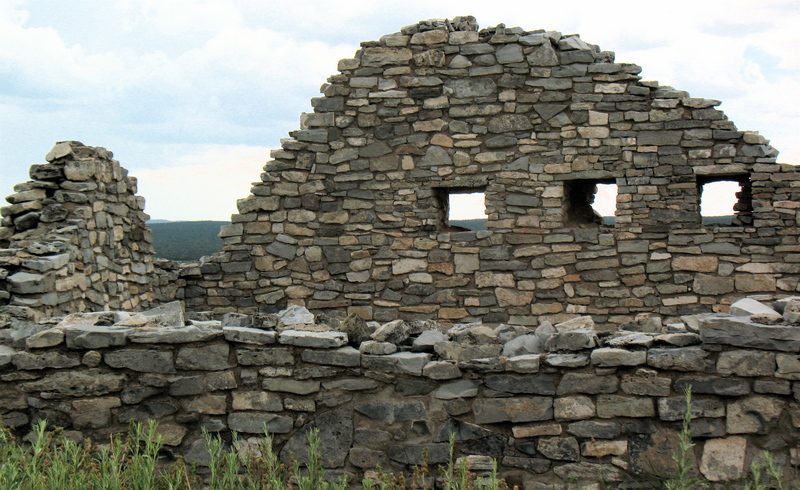 Kivas were burned and filled with trash. Still, it seems certain that indigenous religious practices continued in secret. In the largest building’s very center is a mysterious room, four stories deep and at least ten rooms from the outside. Speculation is that the Puebloans may have continued their own worship there and in other secret rooms, hidden from intrusions from the outside world. The first time we visited Abó was in the early 1980s. 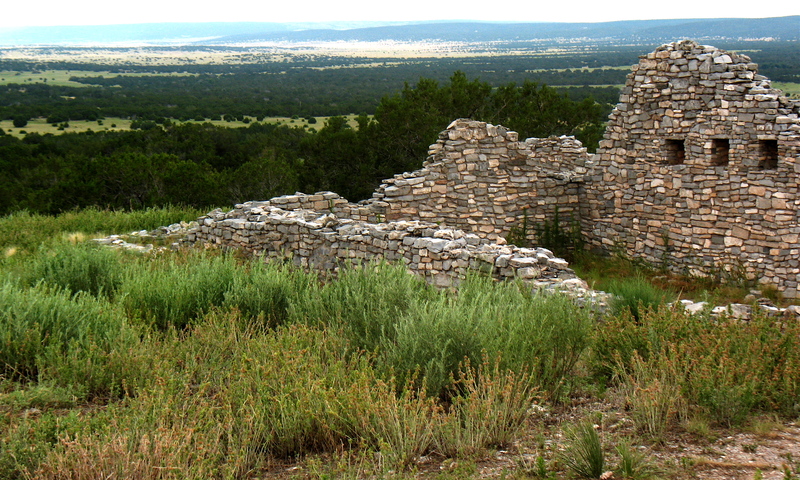 Back then it was a state monument, its ruins partially restored by the Museum of New Mexico in the 1930s. Manning the visitor welcome center, a miniature adobe room heated by a potbellied stove, was a local Hispanic man who, once Abó was added to the National Park system in 1980, became the oldest park ranger in the US. That winter Sunday we had ended up at Abó when a freak snowstorm made our intended return trip to Santa Fe via the eastside of the mountains impossible. This time the opposite weather had occurred. Summer had turned us into lizards skittering for any available shade. 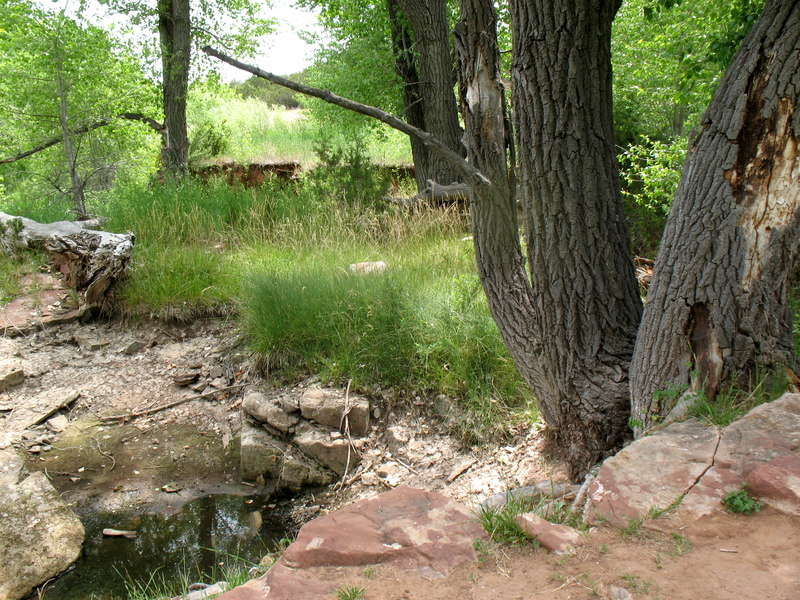 At Abó, we clung to shadows of the mission ruin’s red sandstone walls and followed the path around the pueblo more from juniper-to-juniper shade pools than from information sign to sign intended to sketch out the rise and fall of the pueblo and mission. 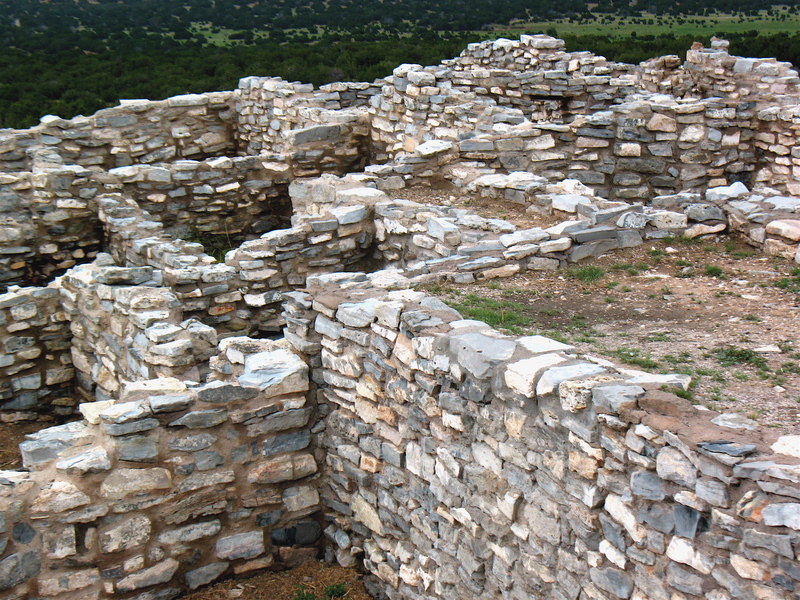 Abó is the largest unexcavated pueblo of the three in the monument group and its church ruins, tumbled as they are, are massive. The original and then a second, even larger, church complex of cathedral and convento living quarters were built on a construction design and scale almost impossible to imagine, even under the best of seventeenth-century circumstances. That the plans originated in the mind of some amateur padre architect, equipped only with his missionary zeal and a crew of forced laborers in the back and beyond of central New Mexico, makes the buildings all that much more remarkable. Most strange is the convento plaza’s kiva. 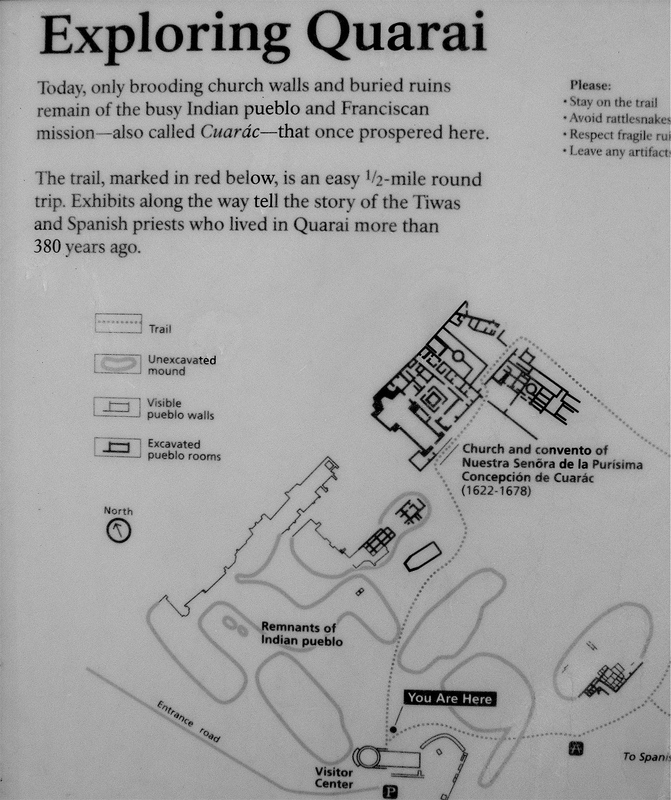 How did the local Catholic priests, the same ones who went on to conduct mid-1600s Inquisition inquiries from Quarai (which also contains an interior kiva), square the kiva circle, theologically speaking? Some say the priests used the familiar subterranean religious space to lure the Indians into the new Christianized setting. To me it is more likely a case of self-protection: Why not hedge your bets and appeal to any god who might be looking down on this farthest outpost of the civilized world? 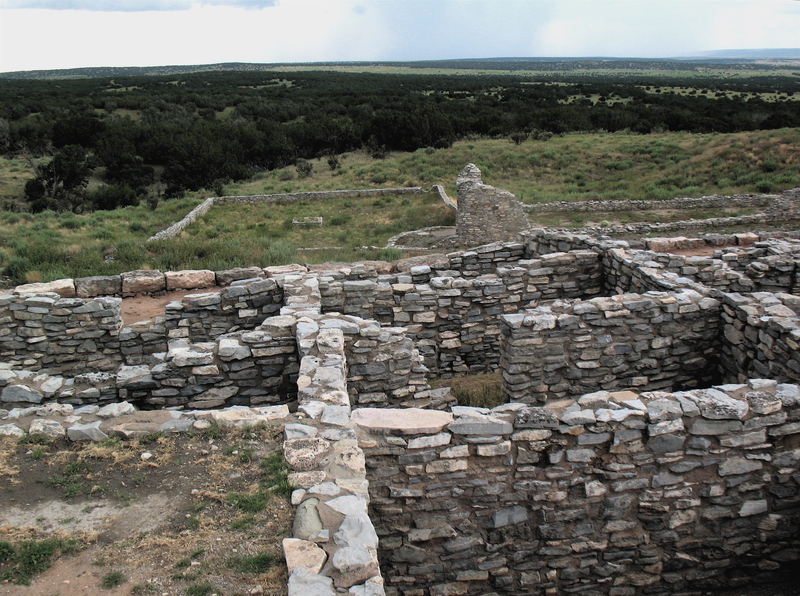 Scattered north, west and south of Mountainair are the three units of the Salinas Pueblo Missions National Monument—Quarai, Abó and Gran Quivera/Los Humanas. 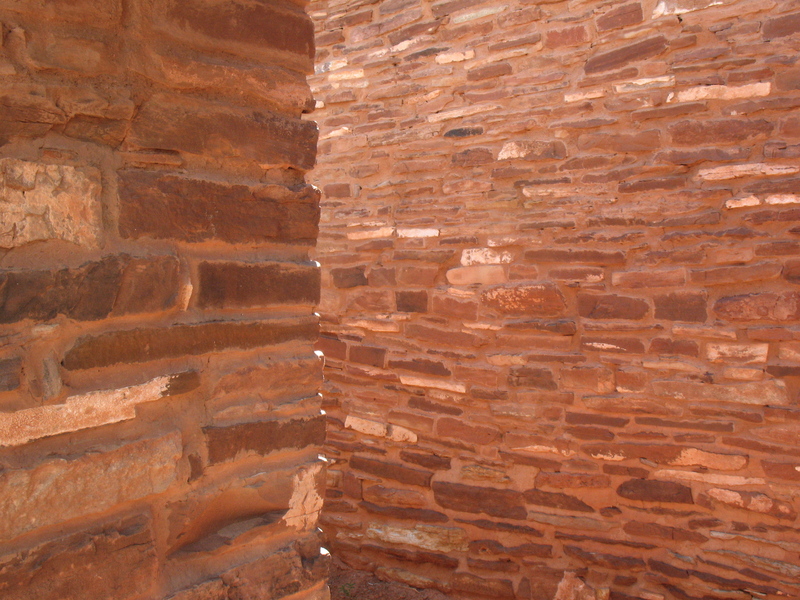 A little-known Monument (less than 38,000 visitors in 2009), the three units offer a remarkable window into the earliest intersection of Native Americans and the Spanish in New Mexico. I think the Monument’s name suggests the conflict which played out so tragically at these sites. What’s the key feature—the outsized 17th century Catholic mission churches whose ruins rise up like ships out of the sea of plains, or the 800 hundred year old, mostly unexcavated, pueblos that form a nouveau topography of tumbledown stones and tussock grasses around them? All three sites speak to the indigenous people’s ingenuity, finding both water and a strategically defensible location in what appears, to a novice like me, to be dry and only very gently rolling terrain. An uncanny understanding of locale becomes crystal clear as I approach Quarai up a secret draw beside a cool cottonwood-surrounded spring. Abó sits atop a mini-mesa flanked by arroyos and a rain catchment. Only at Las Humanas, a brilliant strategic location affording a panoramic view from atop Chupadera Mesa (a necessity for spotting approaching Plains Apaches) did residents need to haul in water. 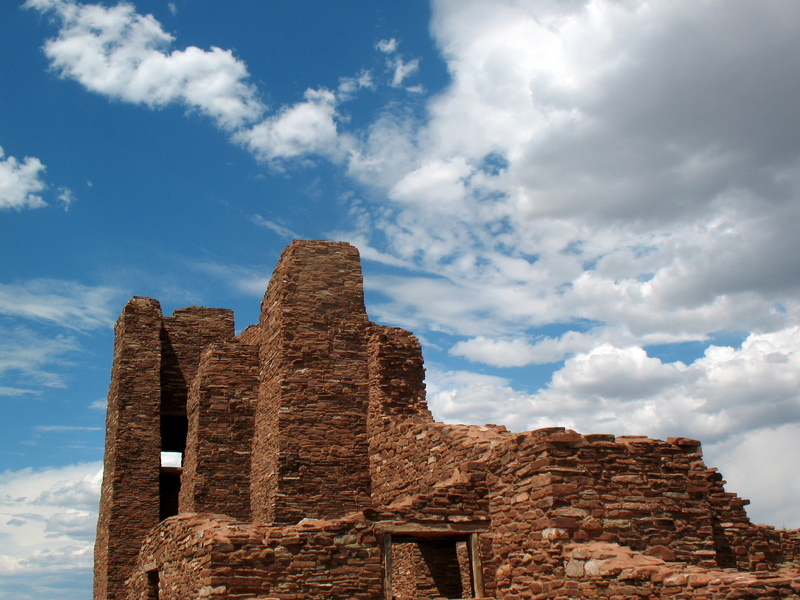 The three pueblo towns are, by modern standards, relatively close geographically and shared a common cultural blend of Mogollon and Ancestral Puebloan. But, they had, it seems, little direct connection with each other when the Spanish arrived in 1698. Each spoke a different language and didn’t intermix or trade. Still, the Catholic padres lumped their inhabitants together into one administrative province and began, with missionary zeal, to press them into service constructing enormous churches and growing food for the new arrivals. It took only three generations to wipe out the Native population built up over 500 years. It’s tempting to blame the weather—there was a drought after all—but I’ll wager the internecine war between Spanish clerical and civil authorities over the use of indigenous labor, as well as new diseases, overwork and overpopulation, didn’t help much either. By 1677 all three sites had been abandoned.